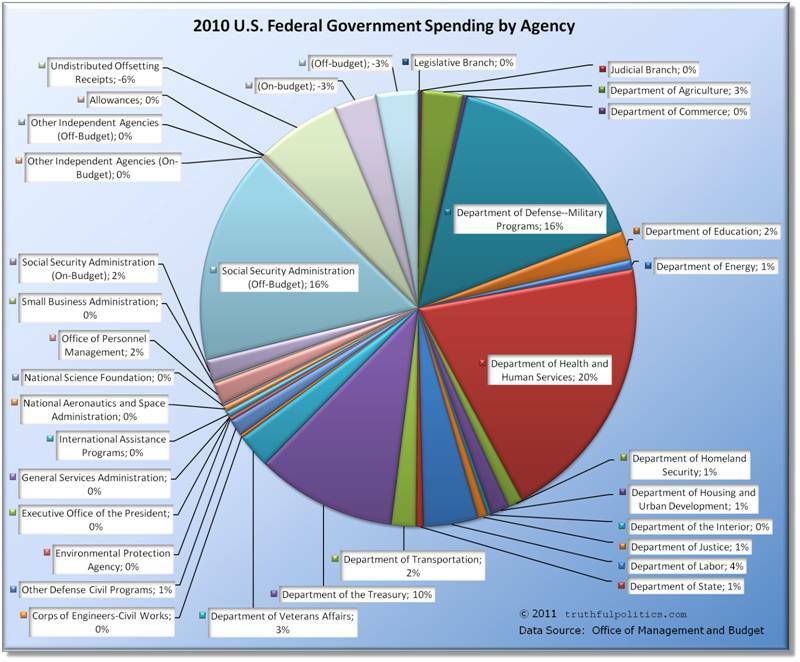 Below is information from many different sources on how the U.S. federal government spends money. Several bar and pie charts are also included. All the charts expand to make the data easier to view. Click on a chart to expand it, and click on the expanded chart to shrink it back to its original size. 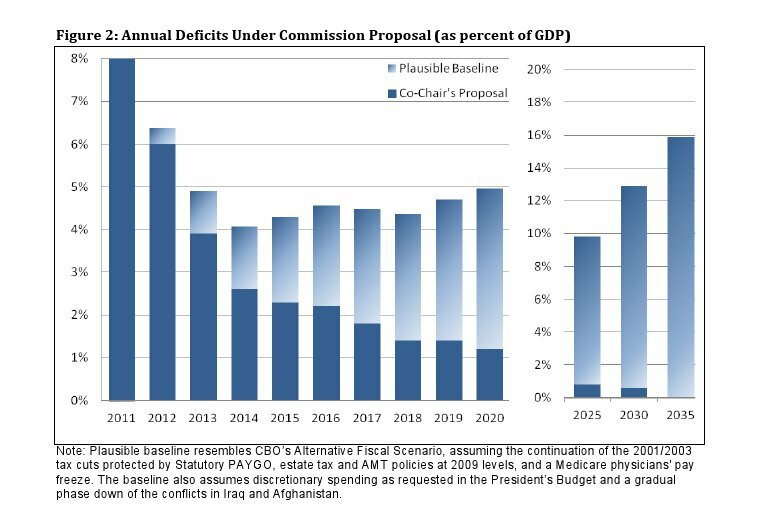 The first three charts are from the Office of Management and Budget, which provides the official numbers for the annual budget for the U.S. 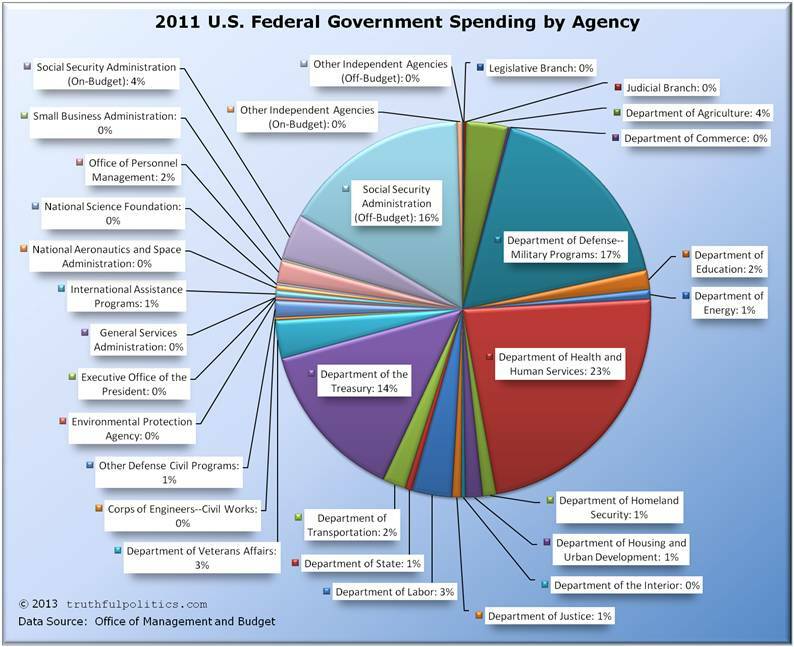 The first chart shows spending by government agency as of 2011 (the most recent numbers available as of the writing of this article). “Undistributed Offsetting Receipts” are not included. Some of the percentages are 0% due to rounding. To view the source data, please refer to Table 4.1 of the budget. 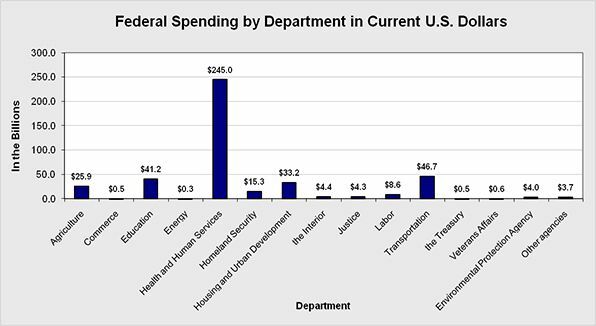 The second chart shows spending by government agency as of 2010. 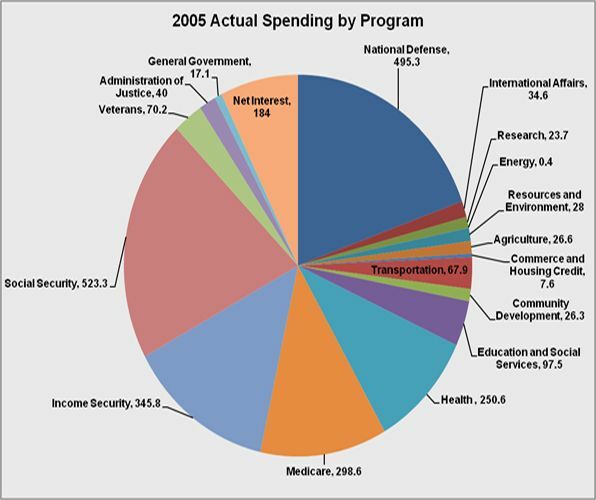 The third chart shows spending by government program as of 2010 (the most recent numbers available as of the writing of this article). To view the source data, please refer to Table 27-14 of the budget. To read additional information, including the source data, click on Budget of the United States Government. 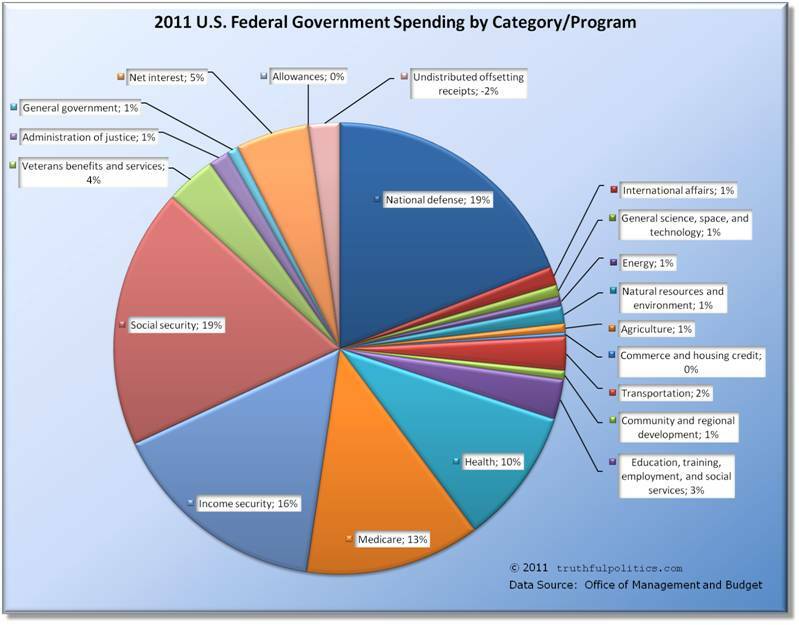 Click on Federal Budget Spending, Deficits, and the National Debt to visit the website. 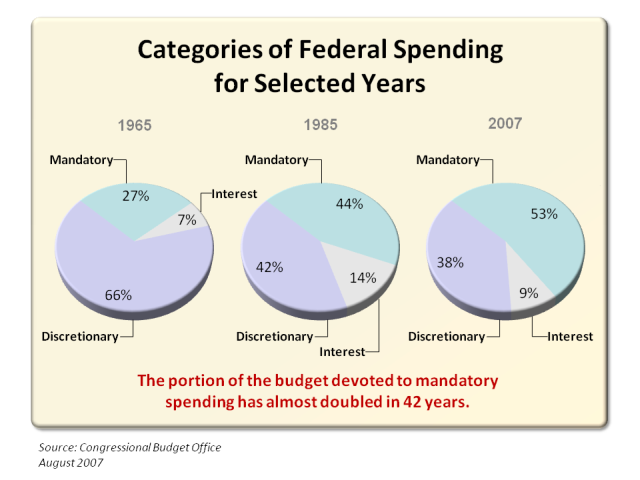 For more charts, click on Federal Budget in Pictures. Additional information and charts are no longer available as Perot Charts is now discontinued. For additional information, click on Project America: Budget: Spending: Spending By Department. For additional information, click on Project America: Budget: Spending: Spending by Program. To read the entire article, click on How Uncle Sam spends your tax dollar. truthful politics reviewed U.S. government employment statistics provided by the United States Bureau of Labor Statistics. The Bureau of Labor Statistics provides the official numbers on jobs for the U.S. The chart shows the number of employees in thousands. Federal employment is indicated on the left vertical axis (i.e., in January of 2012, federal employees, including the Postal Service, equaled 2.8 million). State and local employment is indicated on the right vertical axis (i.e., in January of 2012, local employees equaled 14.1 million). Blank years of 1937 and 1938 have been added to make the year markers match presidential terms. To see the raw data on the Bureau’s website, use Series IDs CES9091100001, CES9091000001, CES9092000001, and CES9093000001. 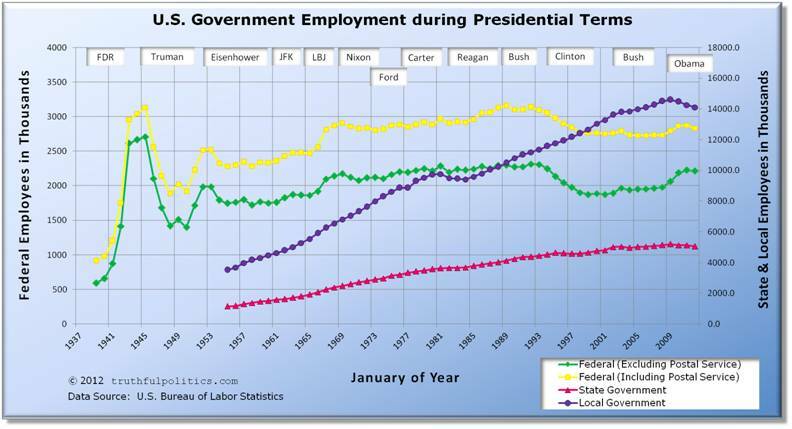 “Under the 20 years of Republican administrations the number of non-defense government employees rose by 310,000. Under the 20 years of Democratic administrations, the number of non-defense government employees rose by 59,000. To read the entire article, click on Just for the Record Part II. truthful politics reviewed the official Executive Branch and Uniformed Military employment numbers provided by the U.S. Government Printing Office. For further information, click on Budget of the United States Government: Main Page. Brian Doherty in Reason in February 2003 reported that over the past 40 years, Democratic administrations have added 31,000 civilian defense jobs and 49,000 non-defense jobs. Republican administrations over the same time have reduced civilian defense jobs by 426,000 and added 320,000 non-defense jobs. "Total Executive Branch Civilian Employees: 1940-2001"
To read the entire article, click on All the presidents’ employees – Data – federal employment growth or shrinkage by president – Brief Article. 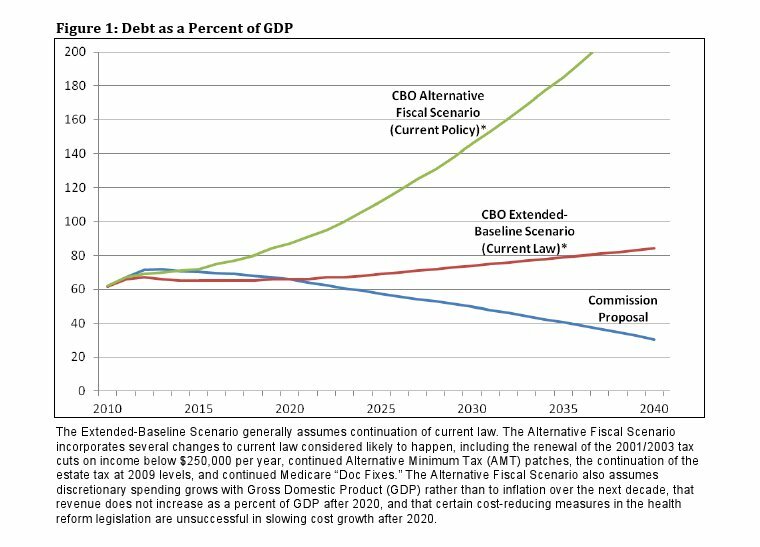 This article contains several charts and videos concerning the National Commission on Fiscal Responsibility and Reform. All the charts expand to make the data easier to view. Click on a chart to expand it, and click on the expanded chart to shrink it back to its original size. 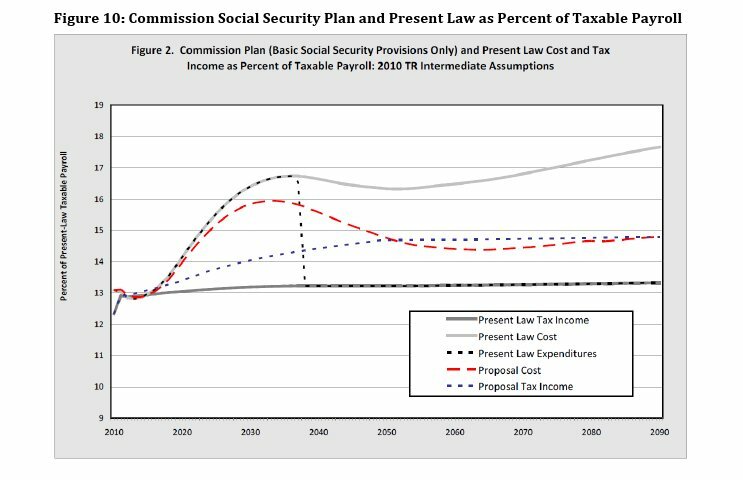 The National Commission on Fiscal Responsibility and Reform was a bipartisan, meaning it involved members from both the Democratic and Republican political parties, commission “charged with identifying policies to improve the fiscal situation in the medium term and to achieve fiscal sustainability over the long run.” The Commission is sometimes referred to as the Bowles-Simpson Commission, Simpson-Bowles Commission, or Fiscal Commission. Following are some of the charts and information from the report. Click on the chart to expand it for easier viewing, click again on the expanded chart to shrink it back to its original size. To read the entire report, click on The Moment of Truth. 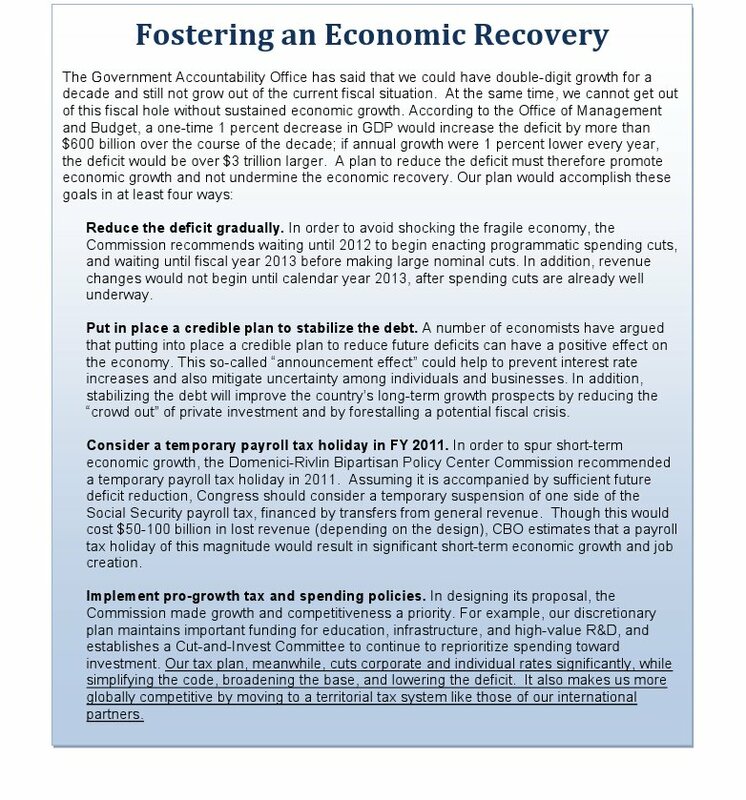 To view the Commission website, click on National Commission on Fiscal Responsibility and Reform. Following are three videos with the co-chairmen of the commission, Erskine Bowles and Alan Simpson. truthful politics reviewed historical statistics on U.S. federal government revenue as provided by the Office of Management and Budget. The Office of Management and Budget provides the official numbers for the annual budget for the U.S. 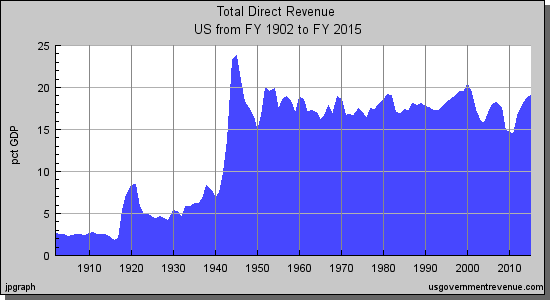 This article has several charts on U.S. federal government revenue; click on the chart to expand it; click on the expanded chart to shrink it back to its original size. 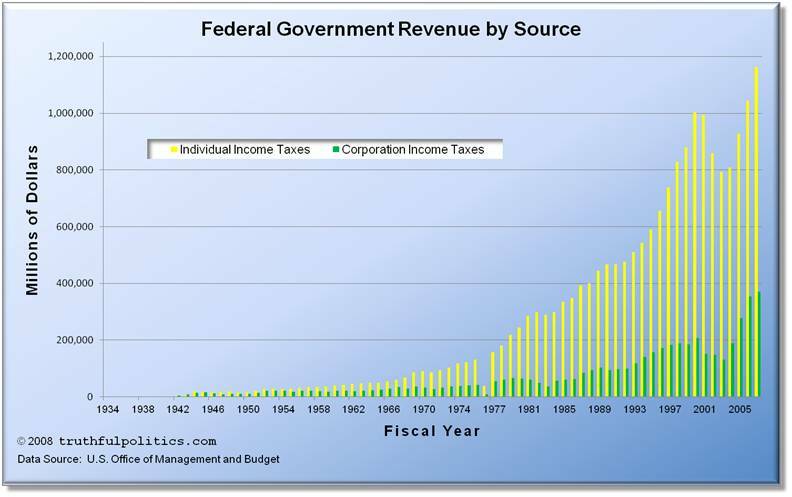 The first chart shows how much tax revenue was received by the federal government annually since 1934. The raw data comes from Table 2.1 of the budget report. The second chart also shows how much tax revenue was received by the federal government annually since 1934 and its raw data comes from Table 2.1; however, the chart only shows individual and corporate income taxes. 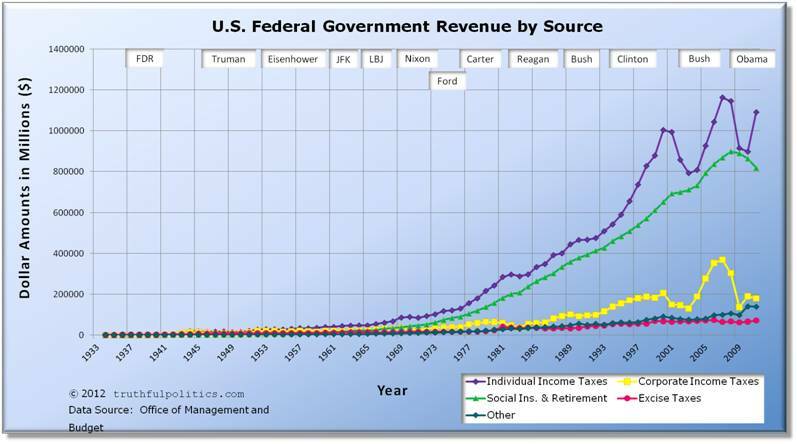 The third chart shows how much tax revenue was received by the federal government annually since 1940. The raw data comes from Table 1.3 of the budget report. Current Dollars displays the amount of revenue received in the value of the currency at the time received. Inflation Adjusted Dollars displays all dollar amounts in constant fiscal year 2005 dollars, as provided by the Office of Management and Budget. Therefore, dollar amounts prior to year 2005 are inflated and dollar amounts after 2005 are deflated. For example, U.S. federal government revenue in 1940 was $6.5 billion dollars; that revenue level is the equivalent of $81.4 billion in 2005 dollars. Likewise, U.S. federal government revenue in 2010 was $2,162.7 billion dollars; that revenue level is the equivalent of $1,919 billion in 2005 dollars. Percentage of GDP is the revenue received divided by the GDP for the year. GDP stands for Gross Domestic Product and is a measure of the economy as it measures the total market value of all final goods and services produced in a country in a given year. 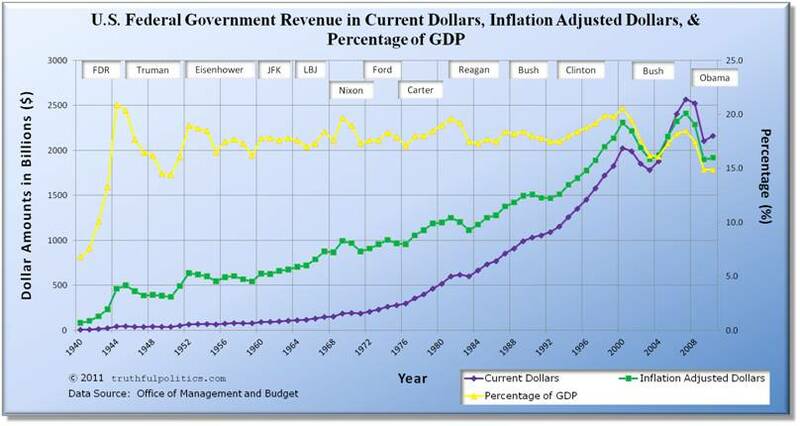 Therefore, tax revenue as a percentage of GDP shows U.S. federal government revenue as a percentage of the economy. 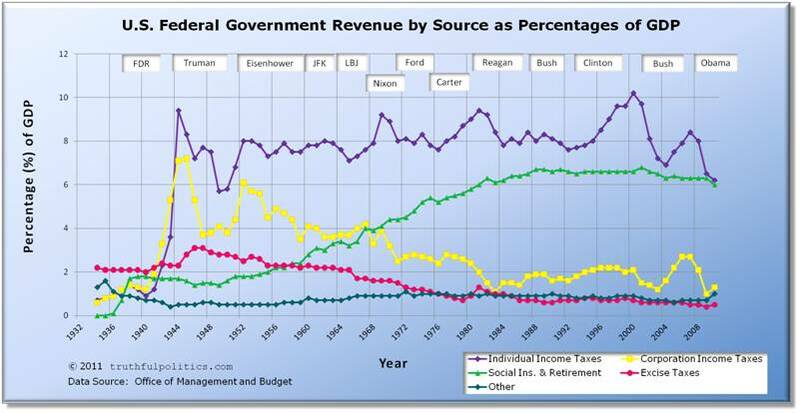 The fourth chart below shows how much tax revenue was received by the federal government annually since 1934 separated by different sources of revenue. The raw data comes from Table 2.3 of the budget report. Blank years of 1932 and 1933 have been added to make the year markers match presidential terms. To read additional information, see the raw data, or view additional tables, click on Government Printing Office. This article contains statistics on state ranking, economic, education, poverty, debt, and health care areas of Mitt Romney’s record as governor of Massachusetts from 2003 – 2007. To view rankings of all 50 states for both years above, click on America’s Top States for Business 2007 and/or America’s Top States for Business 2012. In December 2006, Massachusetts’ unemployment rate was 4.7%, while the national average was 4.4%. To read the entirety of the articles containing the source data, click on Claims and counter-claims on Mitt Romney’s Massachusetts record, Mitt Romney’s Massachusetts record: proof of ‘strong leadership’?, and/or the Bureau of Labor Statistics. Massachusetts placed first on the National Assessment of Educational Progress exams from 2005-2011. To read the entirety of the articles containing the source data, click on Mitt Romney’s education record was mixed, Romney’s record on education includes successes, failures, and/or Dropout Rates. The table below shows the percentage of the population below the poverty level. To view the source data or see data for other years and/or states, click on American FactFinder. During Romney’s tenure, state debt averaged 9% of personal income, second worst in the nation. To read the entirety of the article containing the source data, click on Is Romney’s Massachusetts record really as bad as Obama says? To read the entirety of the article containing the source data, click on ‘RomneyCare’ Facts and Falsehoods. This article has several statistics from several sources on the U.S. education system compared to other countries. U.S. ranks 21st in high school graduation rate compared to other industrialized nations. U.S. students rank 25th in math compared to other industrialized nations. U.S. students rank 21st in science compared to other industrialized nations. To read additional information from the Broad Foundation on education, click on Background on the Crisis. 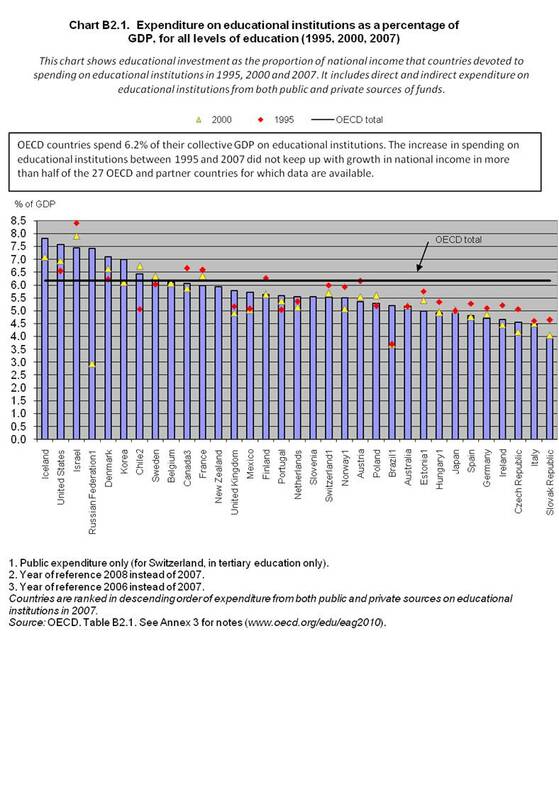 To read the entire article, click on U.S. Education Spending and Performance vs. The World [INFOGRAPHIC]. To view the source data, click on Key indicators on education and use Indicator B2. 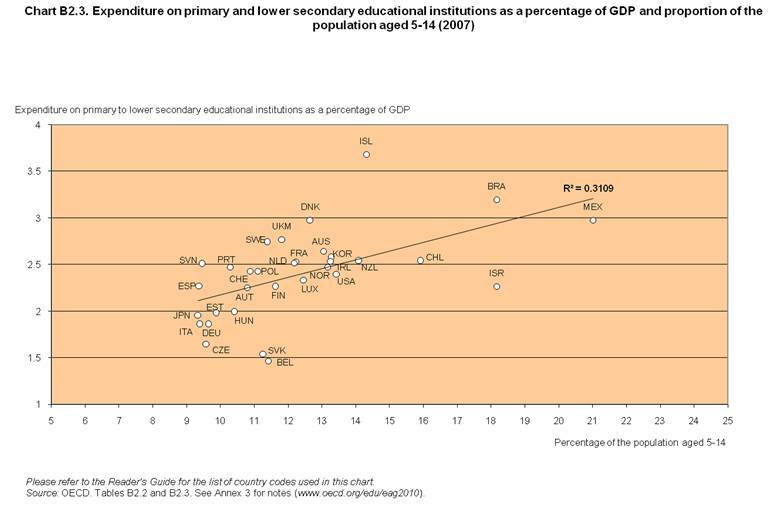 To view other charts and statistics, click on Key indicators on education. To read more information about the Supreme Court, click on Supreme Court of the United States. To see a list of all Supreme Court Justice nominations, whether they were confirmed or not, the president who nominated them, etc., click on Supreme Court Nominations, Present-1789. To see Supreme Court statistics, click on SCOTUSblog Statistics. The Brown v. Board of Education decision in 1954 that said segregated public schools are unconstitutional was fewer than 4,000 words. The Parents Involved v. Seattle in 2007 was 47,000 words. Some decisions have been vague or ambiguous. The Citizens United v. Federal Election commission decision in 2010 was more than 48,000 words. To read the entire article, click on Justices Are Long on Words but Short on Guidance. Dredd Scott v. Sandford in 1857 decided that descendants of slaves were not entitled to Constitution liberties, including freedom and U.S. citizenship. Buck v. Bell in 1927 said that institutionalized individuals may be sexually sterilized. To read the entire article, click on Legal scholars examine the U.S. high court’s ‘Supreme Mistakes’. To view the 60 Minutes website, click on 60 Minutes. The truthfulpolitics.com website is back online after some technical difficulties. Sorry for the inconvenience. Take a look at the update and the articles! truthful politics has 3 different charts showing the number of jobs created in the U.S. organized by presidential terms and/or political party. To view total U.S. jobs created, including government jobs, during presidential terms and/or political party, click on U.S. Job Creation by President/Political Party. To view total U.S. private sector jobs created, thus NOT including government jobs, during presidential terms and/or political party, click on U.S. Job Creation by President/Political Party. To view total U.S. jobs created, including government jobs, during presidential terms and/or political party alongside the top tax rate of the time, click on Do Lower Taxes Create More Jobs? Does Cutting Taxes Increase or Decrease Government Revenue? 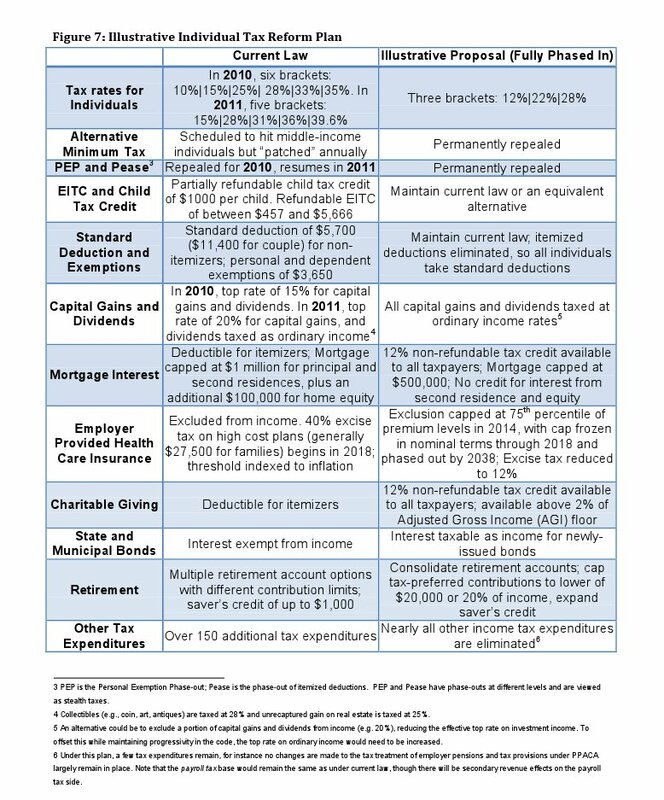 Below are statistics from several sources on if cutting taxes increase or decrease government revenue, or tax receipts. 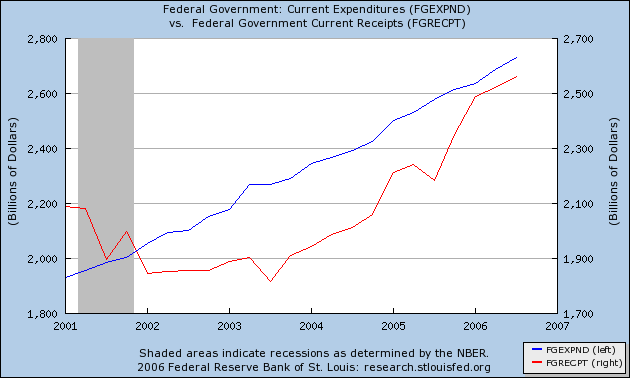 The first chart shows government revenue as a percentage of the economy, or Gross Domestic Product (GDP). The major tax cuts occurred in 1918 – 1925, 1964, 1981, 2001, and 2003. For additional data, click on usgovernmentrevenue.com. In the Bonddad Blog, information is available about cutting taxes for either the wealthy or the lower income classes. 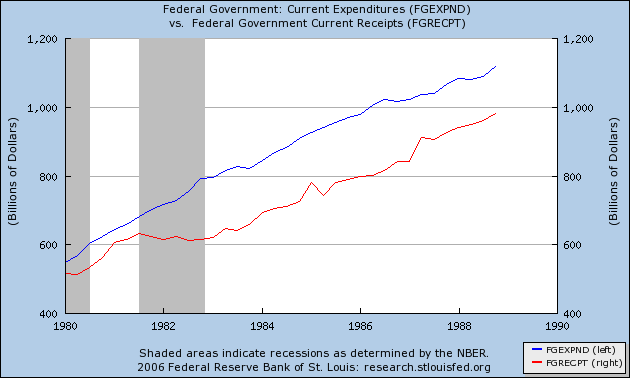 The following charts show government expenditures and government revenue during the 1980’s and the 2000’s. Tax cuts were enacted in the early 1980’s and early 2000’s. To read the entire article, click on The Complete Failure of Supply-Side Economics. Tax revenues from 2000 to 2003 actually declined every year. To read the entire article, click on Supply-side Spin. The entire article may be read by clicking on Cutting Taxes Faster Would Help Everyone. 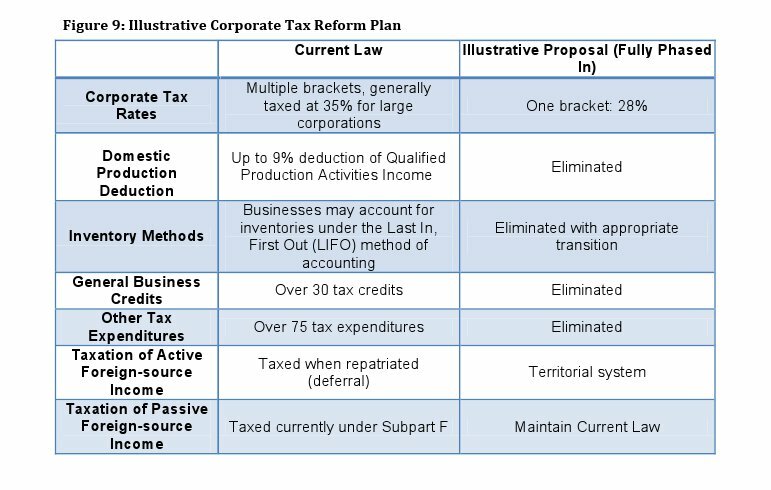 The entire article can be read by clicking Real Tax Cuts Have Curves. The Heritage Foundation has an article describing the Laffer Curve. To read the entire article, click on The Laffer Curve: Past, Present, and Future.